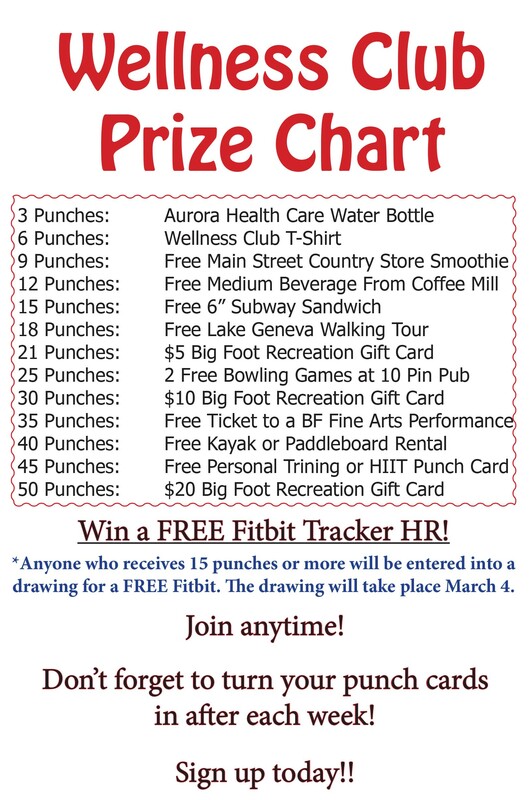 Big Foot Recreation and Aurora Health Care have again teamed up to provide a FREE Big Foot Wellness Club! Questions? 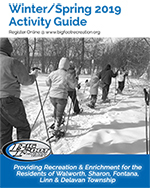 Check out the frequently asked questions, or call the Recreation Office at 262-275-2117. 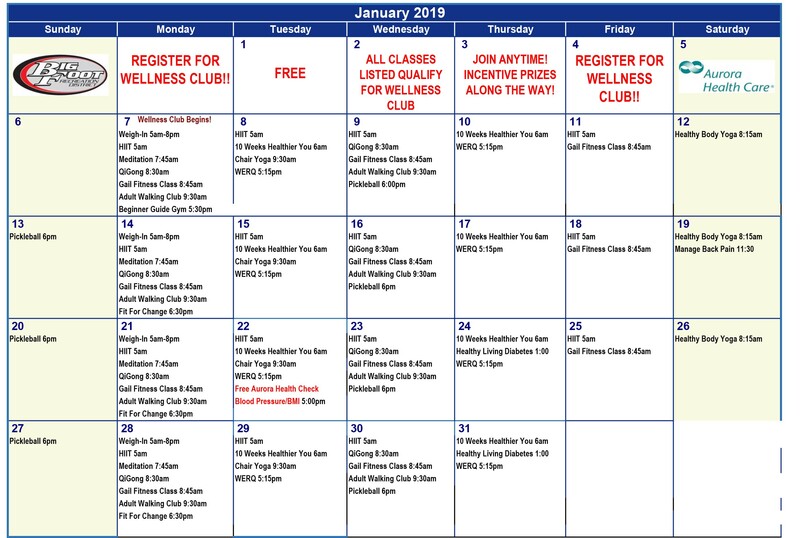 Find throughout the "adult programs" page to see what programs qualify! When does it run? 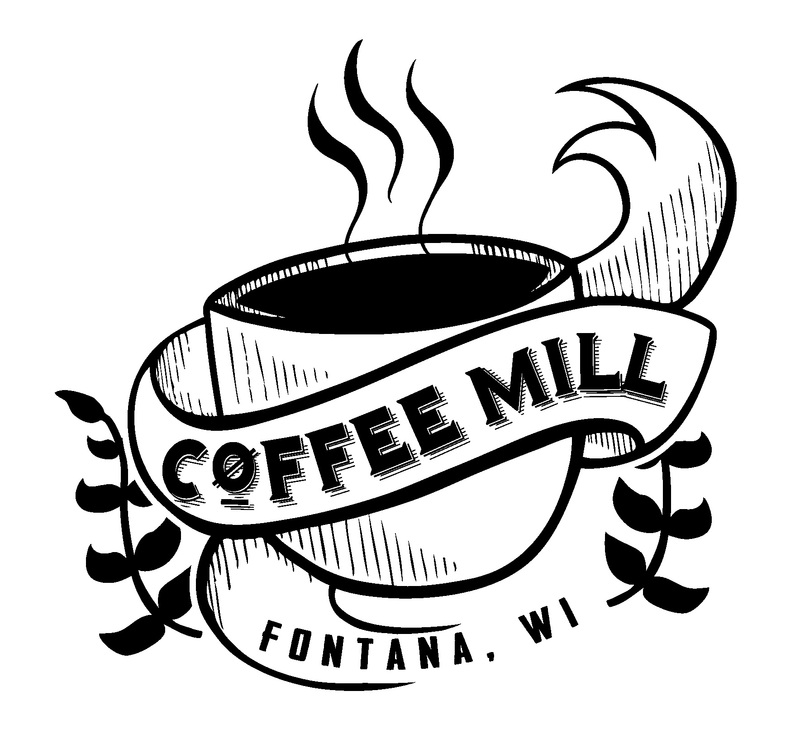 From January 7 - March 3. You can start at any time. How much does it cost? It's Free! Our sponsors have helped make this program a reality - please patronize our sponsors. How does it work? 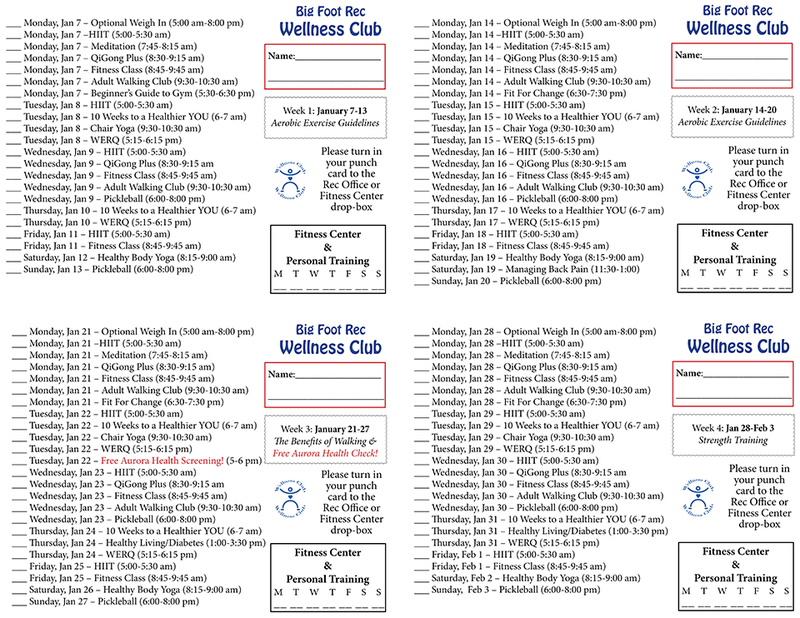 After you register, download your punch card (or get them from the office). 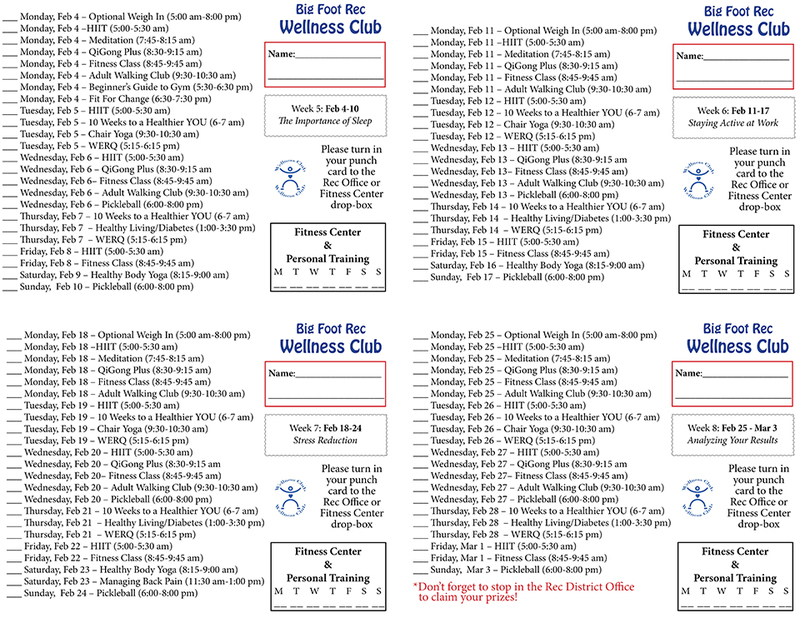 When you attend the fitness center, fitness class/program, or attend a wellness class you get a punch on your card. Turn your card in. As you earn more punches, you qualify for incentives along the way. How do I find qualifying programs? Check out our Adult Program page. Anywhere you see , you can earn a punch when you attend. What is the objective of the program? 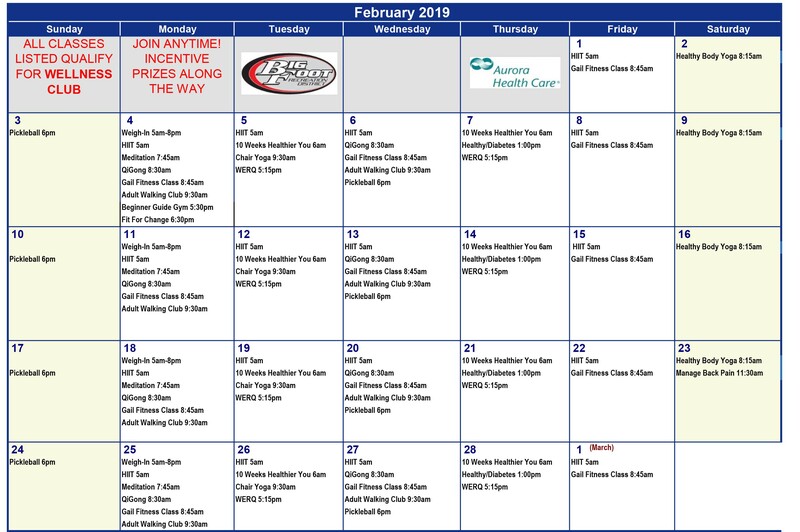 By teaming up with Aurora Healthcare, our hope is to encourage you to start 2019 on a healthy note. We want to see you and our neighbors be as healthy and fit as possible. Ultimately, our goal is to provide fun, motivational incentives to help you achieve your wellness goals. What are the incentives? We are currently finalizing the punch benchmark levels and achievement prizes. Examples include: watter bottles, t-shirts and gift certificates to area businesses. How does Aurora Health Care fit into this? 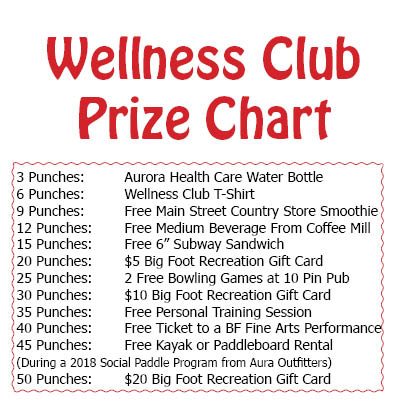 Aurora has been a great partner and will be providing weekly wellness tips and will offer free blood pressure and bone density screenings.